Don't play with your food! Play with your clothes instead! 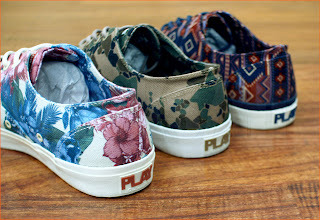 Actually play with your clothes and shoes. At least that is what the brand Play Cloths subscribes to with their eclectic smathering of clothing that ranges from tees to caps to sneakers. 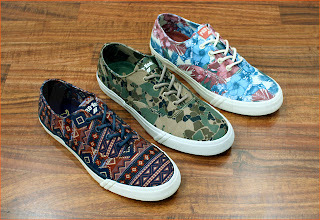 There's always a whimsy to the label especially with their latest offering of footwear for Summer 2102 backed by Keds. Whether you're in the mood for aztec indian, digi camo or bleachy floral, the clean shape of the classic Keds lends itself nicely to the playfulness of the Play Cloths prints. Available now at Kicks Hawaii....and yes they ship!! !